Dispite having a world famous brand, millions of supporters and perhaps unlimited resources, not even Apple is impervious from cyber attack, a problem that is of growing concern in many boardrooms. 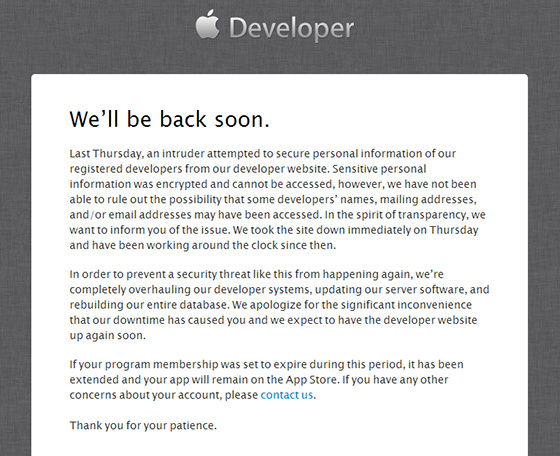 Apple has been forced to apologise to loyal app makers after its developer website was targeted by hackers, disrupting services in the run-up to the release of its latest iPhone OS. Though Apple responded swiftly to the intrusion, it has admitted that some of the developers’ data – such as names and addresses – may have been taken, in encrypted format. Looking at the bigger picture, the reality is, advanced cyber attacks being made by state-sponsored cyber terrorists can take months to control even after being detected an IT security company was warned. Alex Fidgen, Director at MWR InfoSecurity, made the comment following the publication of the Annual Report 2012-2013 from the Intelligence and Security Committee which indicated that cyber espionage had resulted in Ministry of Defence data being stolen. “State sponsored activity is directly interested in the geo-political decisions being undertaken by governments and associated organisations.” “However, this is part of the larger picture of increased cyber espionage activity by one state versus another. While the report focuses mostly on UK Government departments being targeted, this picture is being played out daily amongst commercial organisations”. I am not suggesting the Apple attack was state sponsored merely the implications. Media outlets are reporting alledgedly, a Turkish security researcher named Ibrahim Balic is claiming to have been behind the breach, although he says that the intention was to demonstrate a leak in Apple’s security system, rather than acquire user information.